August 7, 2015 Millionaire Fact of the Day: How often do Affluent investors visit farmers markets? DID YOU KNOW THAT MOST AFFLUENT INVESTORS VISIT A FARMER’S MARKET AT LEAST ONCE A MONTH? If you enjoy cooking or eating fresh produce, a visit to a farmer’s market makes a lot of sense. And the appeal of the displays of fresh vegetables and fruit are not lost on affluent investors. 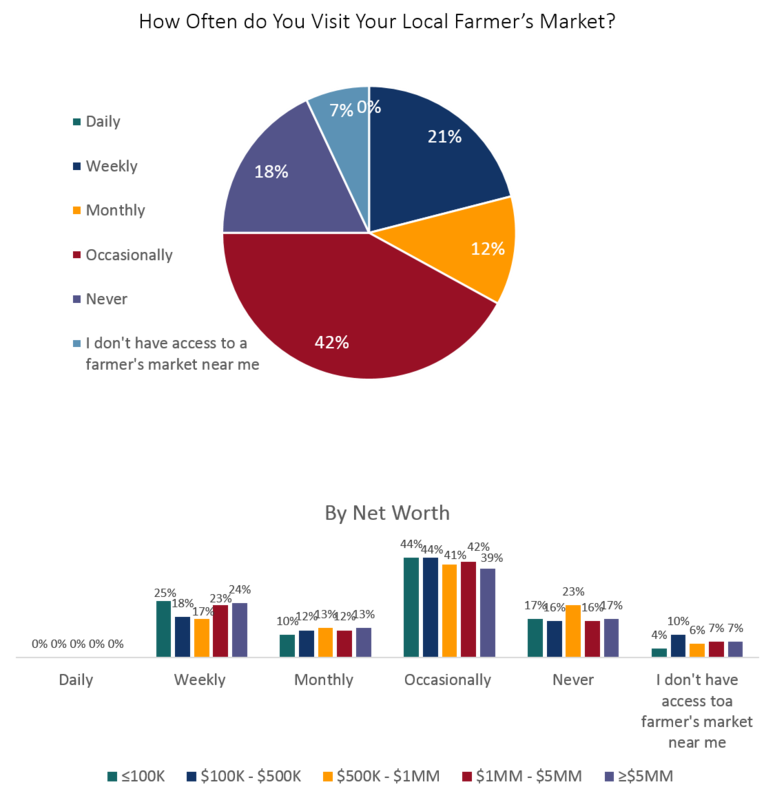 A Spectrem survey of more than 1,000 investors found that most investors get to a farmer’s market at least once a month. While 41 percent said they do so occasionally, 21 percent go to the farmer’s market weekly and 12 percent do it monthly on average. Seventeen percent of investors do not take advantage of farmer’s markets, and 7 percent said they do not have one near them. It is noteworthy that wealth does not seem to be a factor in the percentages accessing a farmer’s market. It is true that those with a net worth of $100,000 or less do frequent a farmer’s market most often, a vast majority of those with greater wealth, up to those with a net worth over $5 million, get to a farmer’s market at least occasionally.